Samuel Saiz takes on Birmingham City's Craig Gardner after coming on as substitute. Leeds United’s winning run came to a surprise end when they went down 1-0 to bottom of the table Birmingham City in a poor game at St Andrew’s. Going into the game on the crest of a wave after two previous wins over the holiday period, Thomas Christiansen’s men created precious little and missed a glorious chance to close in on the automatic promotion places in the Sky Bet Championship. A single goal scored by Jacques Maghoma six minutes from time handed the Whites their first defeat since November. Pablo Hernandez did hit the woodwork for Leeds, but they struggled for large periods after Christiansen came up with a surprise selection in midfield, choosing tall defender Conor Shaughnessy to start in midfield alongside Kalvin Phillips with Ronaldo Vieira and Eunan O’Kane both unavailable. Vurnon Anita was once again overlooked while Samuel Saiz could only get a place on the substitutes’ bench despite his return to fitness and the previously out of favour Mateusz Klich was alongside him. Birmingham started the better with Sam Gallagher’s early volley blocked. Phillips replied with a 25-yard shot that needed to be saved by home keeper David Stockdale. Jeremie Boga went close for the hosts with a curling shot from the edge of the area and only a good challenge by Liam Cooper prevented Gallagher from capitalising on a decent City attack. Birmingham remained the side more likely to score as Maikel Kieftenbeld’s shot deflected just over. 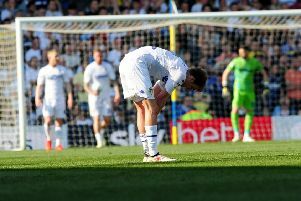 But Hernandez did hit a free-kick over for Leeds before the first half ended goalless. Phillips volleyed over from an Hernandez corner as United tried to start the second half better. But they still failed to make much of an impact until the 74th minute when sub Saiz played Hernandez in and the Spaniard’s shot was well saved, although the ball hit the crossbar. Birmingham had a good chance only for Felix Wiedwald to save well to deny David Davis. The home team took the lead, however, when Jota’s shot was parried by Wiedwald and Maghoma followed up to tap home what proved the winner. Leeds had one chance to pull a result out of the fire when Hernandez was able to get a shot in, but his curling effort went just wide and the Whites’ fate was sealed. Head coach Christiansen did not hide his disappointment. He said: “It was a horrible game. “Not really big opportunities during the 90 minutes. “It was a difficult game. We knew the opponent what they were going to do today. “It’s always a disappointment to not take the three points. Perhaps one point is not a bad result. On why he did not start Saiz, Christiansen added: “I have thought about it but I believe that especially in this time with so many games, the opponent that we had, it was a game to let the game mature a little bit and then in the second half. “First, he will be fresh, he will have the possibility to make the difference which he also did. “There was a big change but the result is also that he came in, in a situation where Birmingham were not so fresh where we could have more space, he could create his game. Birmingham: Stockdale, Colin, Roberts, Dean, Grounds, Gardner, Keiftenbeld, Davis (Ndoye 87), Maghoma (Nsue 88), Boga (Jota 77), Gallagher.